Fairfield Prep's Will Brophy chases down a fly ball hit by West Haven's Bobby Moretti, during baseball action in West Haven, Conn. on Thursday May 10, 2012. WEST HAVEN -- Three days after taking down No. 2 Notre Dame-West Haven, Fairfield Prep couldn't keep the roll going against the team across town. Bobby Moretti's tiebreaking inside-the-park home run with two out in the sixth gave West Haven a 4-2 win at Whitey Piurek Field. "Especially beating the (No. 2) team in the state, we should have come back a lot stronger than we did," said Jesuits pitcher Austin Bonadio, who locked up with fellow senior John Carrano in a brilliant pitchers' duel. "We should've had a lot of momentum, and we didn't." The Jesuits beat Notre Dame-West Haven 5-3 on Monday at home to break a three-game losing streak and bob back above .500. This dropped them back to 8-8. "They beat a great team," said Carrano, whose team is 6-9. "To beat them, that gives us more confidence." Cameron Stone reached on the only error of the game to start the bottom of the sixth; he moved up to third with two out. Moretti lined a 2-2 pitch down the right-field line, just out of Will Brophy's reach. The ball stopped short of a gap in the fence, and the relay didn't connect nearly in time to deny Moretti the homer. "Moretti got a good pitch to hit, and he drove it," Blue Devils coach Mike Anquillare said. "We've been working on going the other way." He also said they've been working on playing good defense behind Carrano. The senior gave up a two-out hit in five of the Jesuits' seven innings, but he and the defense finished those innings off. 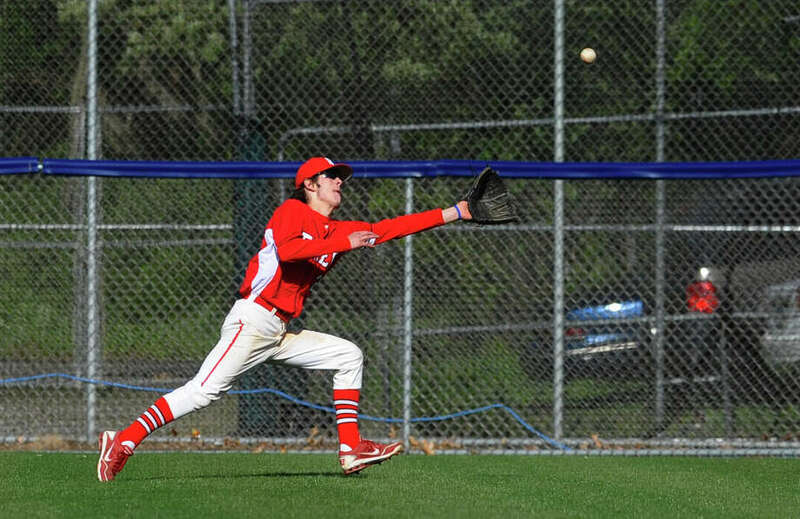 Both teams scored on two-out rallies, Fairfield Prep's in the fourth to match West Haven's in the first. In fact, every hit in the game, seven for the Jesuits and four for West Haven, was a two-out hit. "We've been working on a good two-strike approach at the plate," Jesuits coach Rudy Mauritz said. "That translates to guys hitting with two outs." Shawn Blake's and Kevin Sinclair's hits in the fourth set the table for freshman left fielder Kevin Stone's two-run single to center. That balanced the Blue Devils' first-inning rally. Matt Gagne and Moretti singled ahead of Wes Gambardella's two-run double to right. Bonadio, who has pitched in some hard luck all season, retired the next 13 until the error. "He pitched well enough to win," said Mauritz, whose team was without two injured starters and another who arrived late after an advanced-placement test. "We should've put together better at-bats early in the game. You could see, when we get guys on base, we can do some things." Records: Fairfield Prep 8-8, 3-4 SCC Quinnipiac; West Haven 6-9, 3-5. Batteries: FP--Austin Bonadio (L, 2-4) and Kevin Sinclair; WH--John Carrano (W, 2-3) and Eric Flores. Home runs: WH--Bobby Moretti.